Went to the Street & Studio exhibition at the Tate Modern today. It’s an attempt at showing the history of urban photography, from the mid-to-late C19th to the present. Most of the photos were taken in New York, London, Berlin and other Western European cities. There’s also a fun interactive thing on Flickr, allowing you to submit your own urban portraiture for possible inclusion in a book. Now that would be exciting. That might not be the best example of what I’m about to say I liked, but it was the only one of the ‘Precursors’ I could find on the Tate site. What I liked about the early ones, then, is that despite the old-timey clothes and settings, and the obvious stageyness of the whole set-up, the faces often still look fresh and modern. In one particular photo of a small girl and an old man on the street, the girl looks startlingly 80s, her defiant face, ankle boots and huge man’s tweed jacket looking a bit small-girl-dresses-up-as-80s-Madonna. Yet the photo was from 1910 and was in sepia. It’s a fact that you ignore, while looking at the oldest photos, but that you can’t avoid: all of the subjects must now be dead, no matter how timeless the faces. Other photos, like the one of an 18-year-old boy in the late 1800s, and of a Paris street scene around the same time, are further reminders of how short life is, and how everyone always thinks that things will stay the same, but that our own era is just a little moment, and will look hopelessly quaint to future generations in no time at all. Bendy buses? So old-school. So the Tate people have set up a group on Flickr for people to submit their own photos on this theme. These are the two I’ve submitted: one I took today at St Paul’s, and one from April 2006. Obviously, Ruth and Jules didn’t mind me taking their picture, but taking photos of randoms on my phone did leave me feeling a little weird. There’s a set of shots in the exhibition where a photographer basically stalked a woman through Hong Kong: Young woman in Cheong-San dress 1960, sequence of eight, by Ed van der Elsken. He said of the experience: “I followed this babe around for a while. She knew I was doing it, and didn’t like it one bit.” The creepiness of the situation is etched on her tightly-wound, closed-in face. Not nice at all. 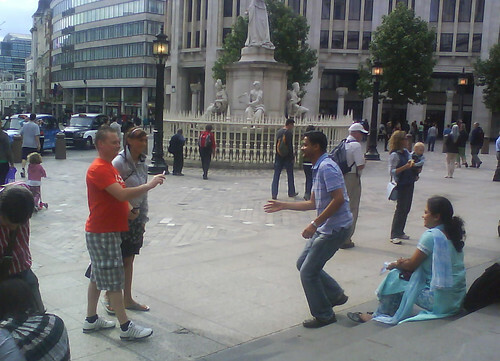 I took a photo of a couple having their photo taken by some other tourists. Originally, I was going to take some of some little girls playing on the steps in front of me, but that seemed a little strange – I didn’t want to worry their relatives. The couple I took a photo of had done that thing that I hate of taking a photo of a monument with the person you’re with in the shot. Why do people do that? But it was rather sweet with them, because they were having fun, and I suppose I can forgive a couple wanting to take pictures of each other. So they got someone else to take a photo of them together, and I caught a photo of the husband as he leapt up again to say thanks and get the camera back. I like how he’s in motion in the picture, the direct, straight lines of eye contact between strangers, and how you can see the couple smiling. I also like the gap between the husband and the man with his camera, which will be closed up in a moment, and then opened again forever, as these tourists pass each other with a thanks and never meet again. I had taken a photo earlier which I had loved, but was a split-second too late to get the best shot. A huge white stretch limo went past, with a load of girls screaming out of one of the back windows. Everyone turned to look, which made for a great shot, as the Essex-girls-on-a-hen-night style limo passed an old-style Routemaster (the number 15, fact fans). I got the photo just as a guy passing obscured the girls hanging out of the limo, which kind of defeated the point of the photo. You need to know what everyone’s head was turned towards. With this photo, I just love how you can see that these two people know each other and are deep in conversation. I also love Jules’ blurred hand. Plus, you’re left in no doubt at all as to which city these two are in, and what they’re doing. For the moment, though, the Tate overlords have decided to only put the first photo in. Soz, Jules and Ruthie. Gosh, what an inspiring exhibition huh?! Go off and see it. Also, don’t forget to check out the empty Turbine Hall (never seen it without an exhibition before), where the cemented-over remains of Doris’ crack are still clearly visible. Hope they manage to sort that one out! Who’s in the picture he’s looking lovingly at? His son? Himself as a boy? I really like his expression.